Our guild is currently working on Kathryn Drummond’s Lily Biscornu as published in the Spring 2015 issue of Embroidery Canada. This project is part of our program for this spring. Lotte von Wuerzen is one of our Program Co-Chairs and she stitched the sample in preparation for our meeting. 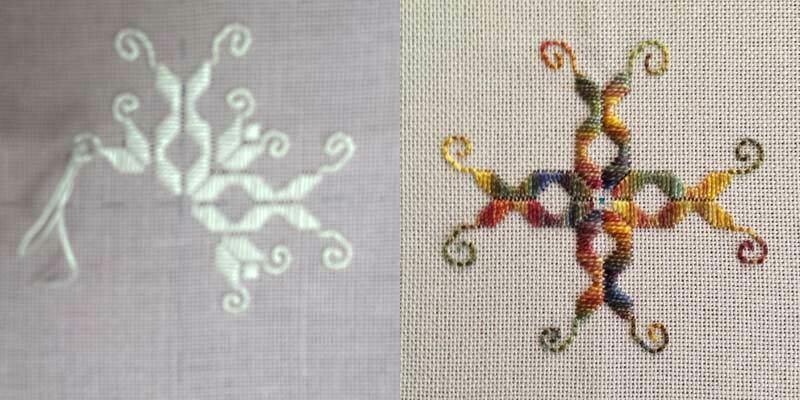 This introduction to Punto Antico works up fairly quickly and it is a nice starting point for our new member who is a long-time cross-stitcher. Heather Hollands is working her biscornu on a dusty mauve linen. Tanoo Angus is stitching hers with an overdyed pearl cotton. 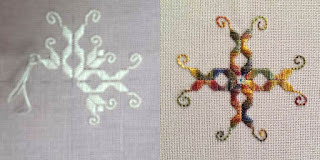 Kathryn Robicheau is working hers on blue linen and will use periwinkle Wildflowers for the accent stitches, Miyuki Delica 0135V beads and white glass pearls. I stitched this and used it as at the top of a cup cake. It is a neat project ,made different by what ever colours the creator chooses. This is a lovely pattern! 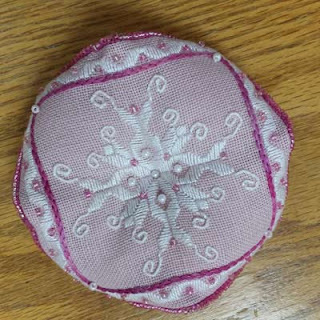 It is a great idea to use one of the projects from Embroidery Canada for meeting projects!